Good event, I for one hate grinding multiple lvl 50s and this should really speed up the process. Patch 1.7.2 brought several new items to the Cartel Market. There are several different types of boosts added, class missions, experience, exploration, flashpoint, social and warzone. All of these boosts have a minor and major boost for each category. Two new crystals were added a white/black and derelict purple. Both these colors can be found to benefit stats in endurance, power, crit, or expertise. Not to mention several new weapons for every class that could potentially use those crystals or a crystal you already have. The latest Cartel Shipment also includes several new armor sets. Some of these have been seen on NPC characters and also some nostalgia armor sets from the Knights of Old Republic single-player RPG games. 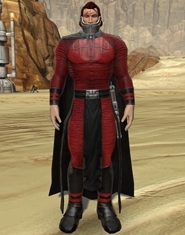 The KOTOR based armors are from the characters Darth Malak, The Last Handmaiden, and Carth Onasi. New pets and speeders were also part of the new shipment of items. 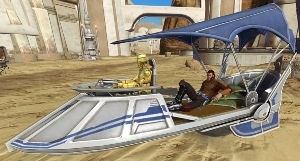 While we are mentioning speeders, two of the more exotic ones are the Cartel Recreational Skiff and the Cartel Luxury Skiff. Not only are these smaller versions of the skiff used in Return of the Jedi, but they include their own droid chauffeur. Be sure to check out more images and all the details from the official SWTOR post on Patch 1.7.2 Cartel items. 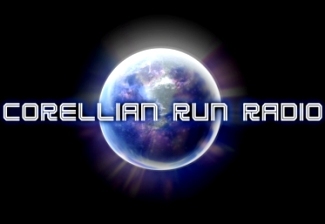 Patch 1.7.2 marked the return of the Gree Event on Ilum and will be here through March 26th. The missions that help players gain reputation with the Gree Enclave are back. I know some don’t consider this a true event, but I can personally vouch for the PVE quests that they are much faster to complete, especially the specimen collecting quest. Every creature dropped a sample that the Gree needed. If you do only the PVE quests, minus the Heroic and World Bosses, it will take you around 45 minutes to an hour tops. It is fairly easy credits, not to mention you gain reputation with the Gree and earn Daily commendations. Plus, if you do want to complete the Heroic, PVP, and World Bosses many people are looking for others to join up in general chat. 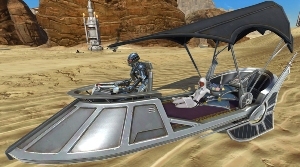 Oh, and be sure to check out the new Gree Enclave speeder, known as the Sphere. Speaking of reputation, BioWare has added a new group to the system. The new group is called the Contraband Resale Corporation. You might have noticed their presence on both Republic and Imperials Fleets. This reputation is based on Cartel packs purchased in a given shipment. This means all packs bought during a given period of time or named the same, like Contraband packs etc. The way a player earns reputation is by opening a pack and consuming a Cartel Market Reputation Trophy. Currently this is the only way players can earn reputation with this particular group. For complete details on this new reputation group and how the trophy system work, be sure to read the Developer Blog on Cartel Reputation, especially the FAQ section located at the bottom of the blog. Hi all, first thanks for the great feedback, we truly do appreciate it. As some of you are aware we have added color crystals as drops from the Scum & Villainy Op, specifically, the Black-Red, Black-Blue, and Cyan crystals which were previously in the old Columi/Rakata weapons. In addition to this, we are also making them Reverse Engineerable and craftable by Artificers. Woohoo! That is some good news for crafters and fans of these specific crystal colors! It is great we are getting these coming in Patch 2.0. I am hoping the other crew skills get some love and new schematics. One thing I did want point out is that I know sometimes there may be a misconception that because we are releasing new items into the Cartel Market, that we are not producing other content. Just to make everyone aware that our Cartel Market and content development teams are two very different things internally. That is to say, us producing new items for the Cartel Market does not adversely mean we are not producing content. We are always doing both of these things and they are released accordingly. I am not sure if that directly addresses any of your concerns, but I thought this would be a good place to make mention of that. Also, as you can imagine our “content developers” are pretty busy with Rise of the Hutt Cartel and Game Update 2.0. I did attempt to address some of the other concerns that you raised in one of my other posts as well, you can see that here (I think you saw it already but just in case). This has been and is a really touchy subject matter on the forums. I will admit that there are times, I do feel the Cartel Market gets the main course and other content seems to feel like leftovers. First off, BioWare is a company and as much as their developers and employees love producing games, they are not working for free nor should they. They need to generate revenue in order to keep the game going and create updates like the upcoming Rise f the Hutt Cartel. That said I would like to see them add some new armor sets, weapons, or other loot drops and schematics. The Cartel Market has shown us the developers are listening about color and variety of items, now if we can see some of that translate into future content besides the Cartel Market, would be greatly welcomed by the entire community. While you are thinking about Double XP Weekends or how much more reputation you need with the Gree Enclave for a weapon or a certain piece of armor, take a few minutes and look over this past week’s articles. As you read through our writers’ articles, please take a moment and submit your feedback and suggestions in the comment sections. We love to hear from you. Thanks and enjoy the links below. Below is a video from a live-panel event in Austin, Texas. Thanks to SWTOR gamingfeeds.com website for the great video and brief introduction article. The video features Jeff Hickman, Damion Schubert, Blaine Christine, and Dallas Dickinson. They spend some time talking briefly about the upcoming expansion Rise of the Hutt Cartel, but the majority of the video is them answering questions about SWTOR. The video is over 20 minutes, but is worth seeing. Notice the emphasis when discussing space combat, not space missions, but they specifically mention space combat. I don’t want to get my hopes too high, but that was very encouraging. Take some time and watch the video and let us know what you think in the comment section below.